The City of Leduc recently hosted its first-ever SNOW FESTIVAL. In this dynamic city that strives to plan and execute fun and interesting events all year-round. This winter event which focused on sports and heritage “was a natural”, shared Carley Graham, an enthusiastic member of the Community Development Team. Developed around the World Sledge Hockey Challenge that took place February 6, 7 and 8, Leduc’s Snow Festival was a huge success, greeting hundreds of local and regional families and winter-loving individuals. ‘The Taste Of Leduc’ was hosted by Kosmos Restaurant and the Best Western Denham Inn in the Leduc County fieldhouse. Extra seats were available for guests to view the Sledge Hockey Challenge Bronze and Gold Games on a large screen, while they enjoyed delicious snacks and refreshments. It is fascinating to hear that the Leduc Zamboni was driven each day from and to the Leduc Rec Centre. Mandy Hatch, a recent addition to the LRC team, was the lucky Zamboni operator who got to drive it down the street at a speed of 7 km/hr, escorted by honks, cheers and stares. Lee Smith is the father of Gavin (a grade six Peewee hockey player) and the Head Coach of the Strathmore Storm Hockey Team which brought fourteen players to this four-on-four Round Robin tournament. He was, “impressed with how well the tournament was organized,” happy to meet Mayor Krishke who did the Ceremonial Puck Drop and accepted on short notice to have his entire team pose for a photo op. Once again, the City of Leduc has outdone itself offering our local residents and visitors from far and wide this new Snow Festival, an exciting opportunity to celebrate winter … in style! 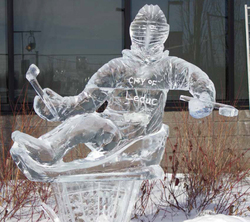 Pictured: Ice carving and sledge hockey were just a couple of the many events headlining the Leduc Snow Festival. Photo by Tom Dirsa.